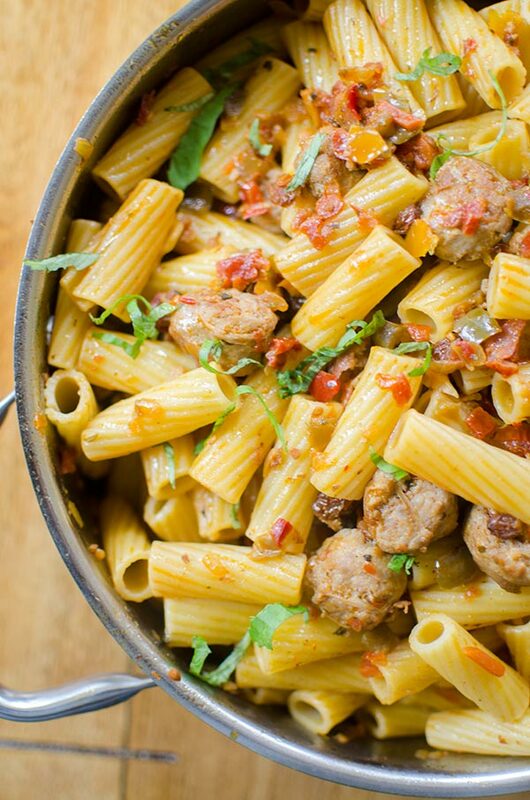 With just five ingredients, this sausage and sweet pepper pasta with fresh basil will be a weeknight staple. Is there anything better than a big pot of pasta? I don’t believe there is. I’m one of those people who will make a big pot of pasta on the weekend and continue to eat it throughout the week. Now, this isn’t a weekly occurrence because if all I was doing was eating pasta, there wouldn’t be any other recipes on my site, would there? It’s all about balance! When I say ‘It’s all about balance’, I mean that for literally everything in my life, there is nothing wrong with cutting back, or slowing down in some areas to ramp it up in others. Now, being a fully fledged foodie, I find that even when I’m really busy or tired, I still want to eat delicious, albeit simple meals. One of my favourite dishes is pasta with sausage and peppers and when I dreamt up this recipe, I had just come off an exceptionally gruelling week at work and the last thing I wanted to do was slice up a billion peppers, onions and the like. Instead, I opened my fridge and pulled out Sweet Pepper Miscela. Which, seeing as its made from all-natural, fresh ingredients, is a must-have fridge ingredient if you’re a foodie who likes to take her health into consideration like me (which I assume you are if you’re reading my site). I like to think of this mixture in the same way I’d use a jar of pesto; it’s a quick and easy way to enhance your meal, and seriously cuts down on prep time. 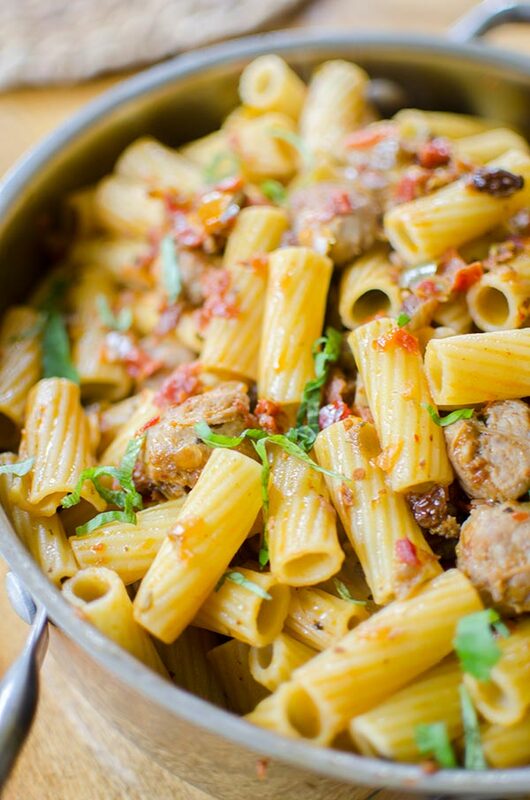 In this five ingredient pasta recipe, the sweet pepper mixture (it’s a combination of bell peppers, spices and raisins) adds all those flavours from your favourite sausage and pepper dishes. The other ingredients are hot Italian sausages, a touch of olive oil, fresh basil and pasta. Yes, of course there is salt, but I’m not calling it an ‘ingredient’ in this recipe, salt is just a given. Right? I’ve loved using Miscela in my breakfast quesadillas and now I’ve been able to see how versatile this ingredient really is. And I’m happy to support a Canadian company (Derlea Foods, the company that owns Miscela) started out as a husband and wife team in Markham, Ontario! Bring a large pot of salted water to a boil, cook rigatoni according to package directions. Reserve 1/3 cup of pasta water before draining. In a large saute pan, heat olive oil over medium heat. Add sliced sausage, cook 4-5 minutes, stirring occasionally until fully cooked. 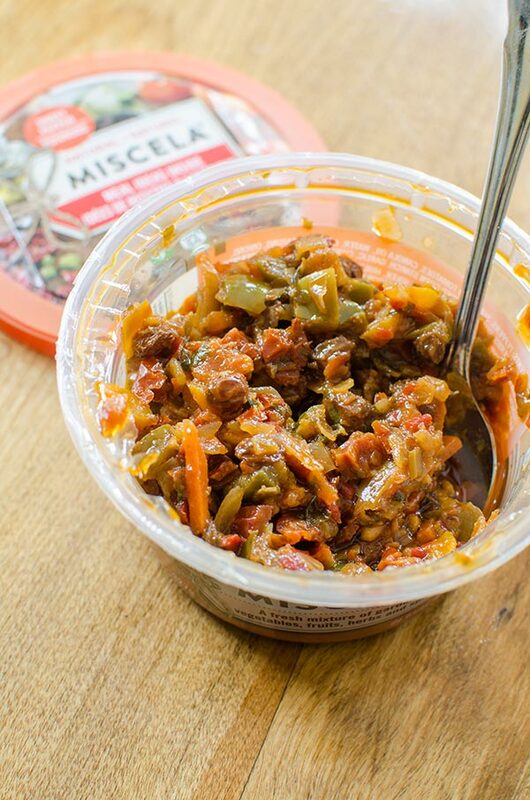 Turn heat down to low and stir in Sweet Pepper Miscela. Add pasta water, scraping any brown bits from the sausage. Add pasta, toss to coat. Disclosure: This post was sponsored by Miscela – as always, all opinions are my own. Thank you for supporting my sponsors and allowing me to continue creating recipes like this 5 ingredient sausage and sweet pepper pasta! This recipe sounds soooo delicious & soooo easy to make! I have never thought to pick up containers of ingredients to make preparation time shorter! I am definitely going to pick up some Sweet Peppr Miscela! It looks yummy, as well & I would then have it on hand to use on appetizers!